In order to keep our body to do its jobs, we need to drink 2 litres of water everyday. Question: how do we keep track on that? Because sometimes we may forget or missed the counting. Knowingly that we might gonna spend whole day outside. So he decided to carry 1 bottle instead and said that he’ll refill it at the park (luckily there are plenty of drinking water fountain everywhere in here). But at the end of the day when we reviewed it, we still couldn’t keep it on track, the bottle still had small amount of waters and he didn’t even refill at all. So 2 liters of water that day was not achievable. Then the rest of the day he just didn’t even have appetite to drink anymore. 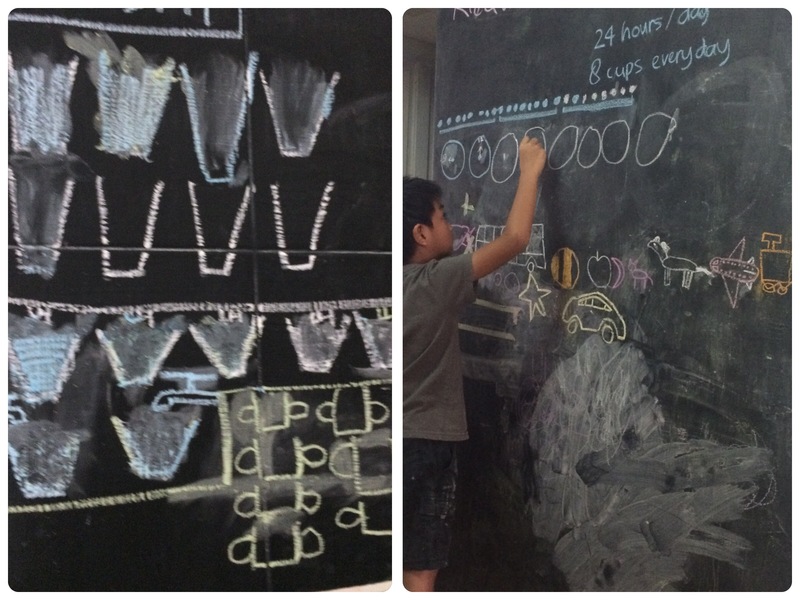 On our chalk wall, he drew 8 empty cups, and clock diagram for every timing he has to drink a cup of water as a reminder. He’s willing to do this everyday. And that 24 hours, he didn’t missed any timing or cups. So 2 liters of water that day was finally achievable!! Horray!! So have you drink enough water today? ?